Are Jeremy Lin & the Brooklyn Nets Better Off Without Kenny Atkinson? 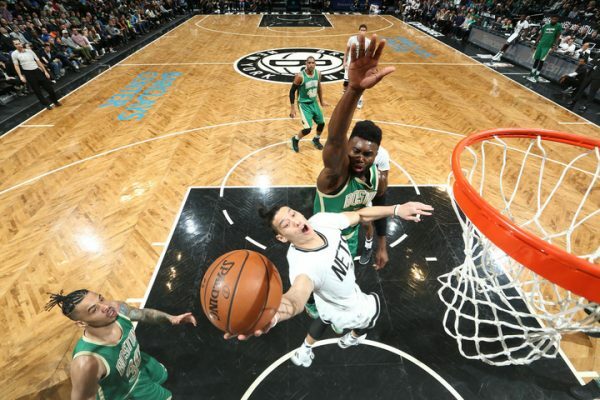 Maybe there’s no reason to get too hung up about the Brooklyn Nets messing up another winnable game, this time losing 95-98 at home to the Boston Celtics. But perhaps it was another example of Kenny Atkinson mismanaging and misreading the situation. Who knows, maybe the Brooklyn Nets need a better head coach. Maybe Jeremy Lin, despite his connection with Atkinson, could benefit from someone else. Let’s leave the insistence on motion offense that puts the ball in the hands of less talented players instead of the one or two guys (more like one) who should be running this offense. Atkinson put Lin in the fourth quarter with less than 3 minutes in the game, afraid to call a timeout or stop what he felt was a good run by the guys on the floor. He waited too long, and when Lin got in the game, the Celtics already had a 6 point lead. This isn’t the first time this season Atkinson shows a somewhat clumsy touch when it comes to the final possessions. In the final possession, Lin didn’t touch the ball. Brook Lopez was the one called up for the shot but took a bad one. Lin grabbed the offensive rebound and Quincy Acy missed the last shot. Hindsight is 20/20, but I prefer putting the ball in the hands of someone who can shooting while in motion instead of a center that took a turnaround 3 without having any sort of balance. Lin played only 21 minutes, finishing with 10 points, 7 rebounds and 6 assists. He’s the Nets best player and looked good during his minutes. Unless he’s having a super-cold night, there should be no way he plays less than both Randy Foye and Isaiah Whitehead. Sometimes it feels as if Atkinson is trying his best to show he can make his system work and win games without Lin being involved, although the team’s record this season (13-55, 8-26 at home) and the number of games Lin missed clearly show they’re better off with him on the floor and with the ball in his hands. Maybe it’s nitpicking, and in a season like this one, it doesn’t matter. Maybe Atkinson simply wants to try and find out who’s good enough to keep along for the ride next season. Lin isn’t going anywhere, so in this season, with the team guaranteed to finish with the worst record in the NBA, there’s no harm in being experimental. But perhaps there’s more to it. Maybe it’s Atkinson struggling to read certain situations and developing scenarios in a game. Maybe Atkinson has a certain modus operandi which, contrary to what many believed when this season began, doesn’t involve his best player and ball handler running the offense. Mike D’Antoni is giving James Harden free reign in Houston and the Rockets built a team in a way that fits. The Nets are trying things that make no sense with their current personnel. Atkinson is something of a D’Antoni student, but the last game against the Celtics and a few warning signs this season might suggest that the brighter future isn’t going to happen with him.